Human ingenuity knows no bounds. We’ve been inventing and improvising since the dawn of time, and we’ll continue to do so as long as we have the will to survive and be comfortable. 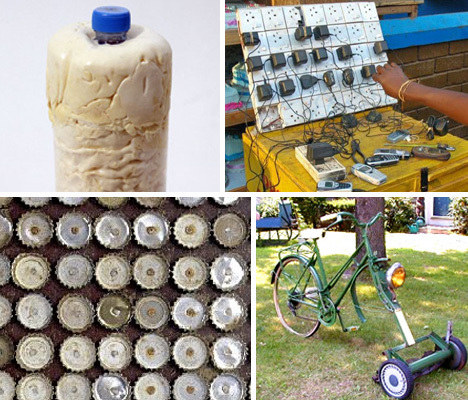 These projects show just how creative people can be – from mashing up unrelated items to make a supergadget to reinventing an item’s purpose, these hacks, tricks and mods are an amusing testament to the creativity of mankind. German photographer Thomas Kalak delights in photographing the unusual, the offbeat, the oft-overlooked quirky parts of everyday life. 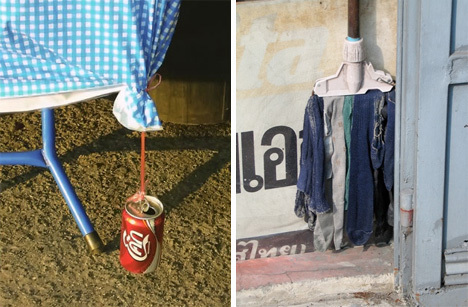 Traveling through Thailand, he noticed the unshakable cheer and endless ingenuity of people there. When they have a need for an item that doesn’t exist, they simply make it out of available materials. 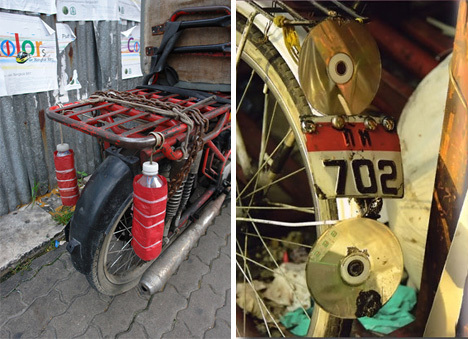 The above images show two ingenious hacks: brake lights made from plastic bottles, red wrapping and light bulbs; and bike reflectors made from old CDs. The improvisations documented by Kalak often involve simple solutions to everyday problems. The Coke can above is filled with water and suspended from a picnic table’s covering to keep the tablecloth from blowing away. The device next to it gives old, unmatched socks a new purpose: cleaning floors as a creative mop. 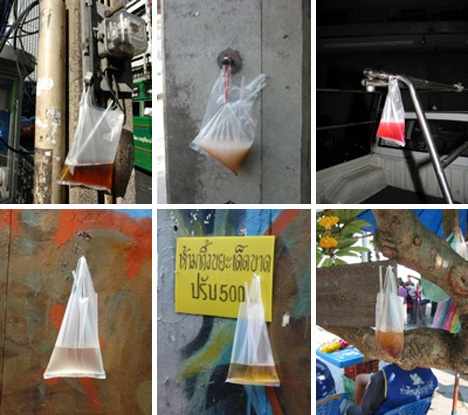 And the idea of using plastic bags as makeshift drink bottles isn’t new in many parts of the world, but these photographs show that it’s an almost mainstream practice in Thailand. Simply stick a long straw in and you’ve got a portable drink container. These photographs and others can be found in Thomas Kalak‘s fantastic book Thailand – Same Same, But Different. 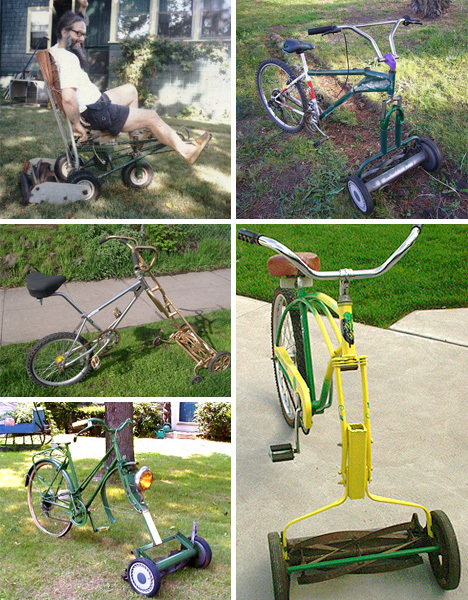 If you saw one reel lawnmower attached to a bike, you might think the person who invented it was extremely creative – which would, of course, be true. But there are so many of these contraptions out there that it’s nearly reached phenomenon status. Whether the mower is mounted in front of or behind the bike, the bike mower is an ingenious way to use the environmentally-friendly gas-free reel mower with the superior strength of the lower body. Of course, some of these homemade mashups probably work better than others. 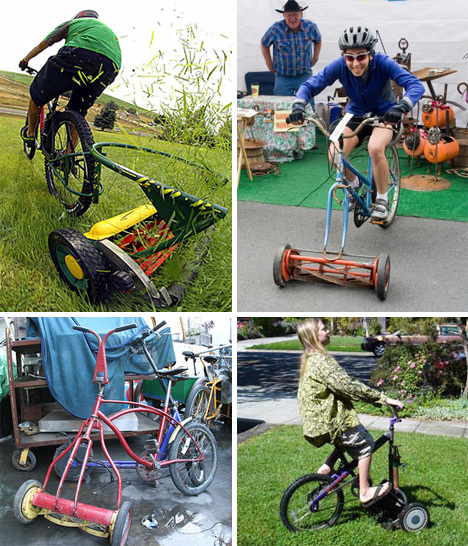 But there’s no denying the creativity that goes into combining a bike with a lawnmower to create a Flintstones-type riding mower. In the former Soviet Union, household items were often difficult to find and/or afford. So when there was a need for an item, creative people found a way to make it possible. 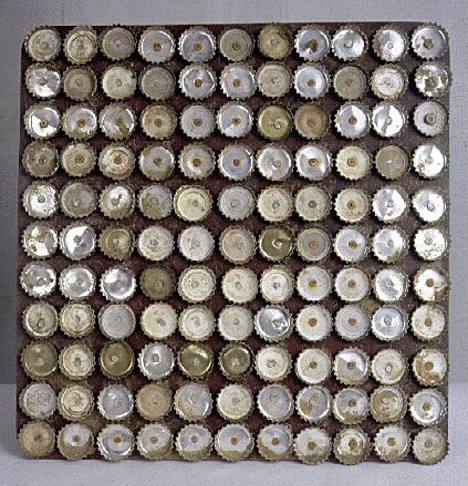 The door mat above is made of beer bottle caps nailed to a piece of wood. The bottle caps helped to scrape the mud off of the shoes of people entering the home. These inventions and many others were compiled by a young Russian man named Vladimir Archipov. He collects them to preserve the folk culture of his country. Above left is a plastic bottle recycled to make cottage cheese in the home kitchen. Above right, an insulated drink bottle made by placing a small bottle inside a larger one, filling the space between the two with expanding insulation, and cutting away the larger bottle. Bottom, a ceramic tea kettle is revamped with a new welded metal handle after the original handle broke off. While sometimes amusing, these inventions are all a poignant reminder to us that we can (and most often should) make do with less clutter, less waste, less over-consumerism. 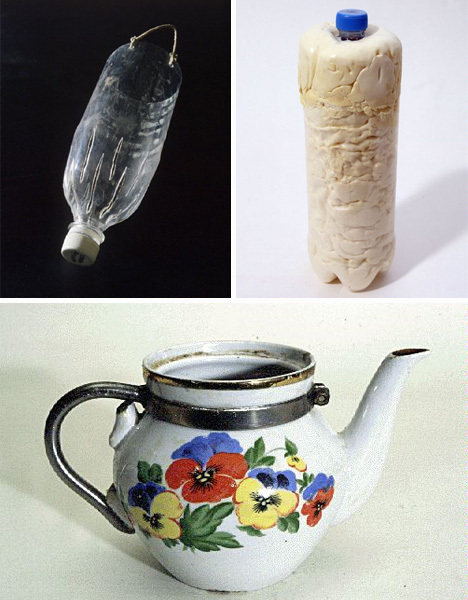 These amazing hacks and improvisations can be found in Archipov’s book Home-Made: Contemporary Russian Folk Artifacts. Electricity isn’t always easy to come by in Uganda. The country is in the middle of an energy crisis with no end in sight, and many homes aren’t even on the electric grid. So how do Ugandans keep their mobile phones charged? Enterprising individuals have set up phone charging booths on the street. 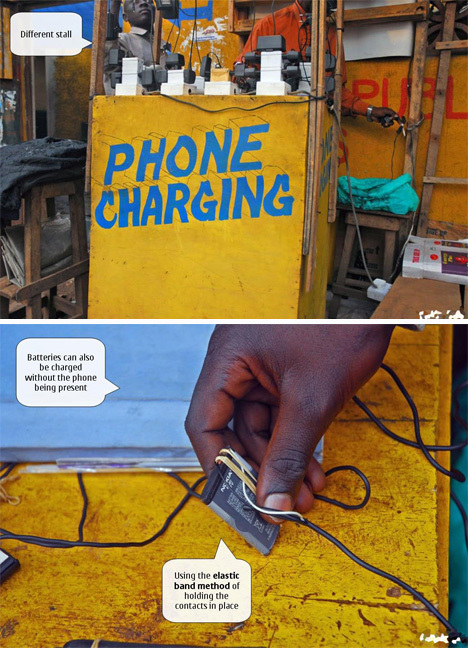 People simply bring in their mobile phone (or just the battery) and pay 500 Ugandan shillings (about 30 cents US) to give their phone enough of a charge to last through two or three phone calls. Jan Chipchase, part of a Nokia research team, traveled to Uganda to research phone sharing and the street mobile charging booth trends. The team found that some of the problems inherent in this type of commercial phone charging setup are the perceived threat of phone theft, the fact that phones can’t be used while charging, and the risk of the customer’s battery being swapped for an inferior one.